Horsham district’s two MPs are both set to stand in June’s general election. Under David Cameron the Conservatives won a narrow majority in the House of Commons back in 2015, with the next national poll due in 2020. But Prime Minister Theresa May has called a snap election for June 8 as she looks to increase the number of Tory MPs and improve her position when negotiating to leave the European Union. Horsham MP Jeremy Quin, who was first elected in 2015, and Arundel and South Downs MP Nick Herbert have both asked their respective Conservative associations to re-adopt them as parliamentary candidates. Mr Herbert said: “I often say that Arundel & South Downs is the best constituency in England. Comprising some 250 square miles of beautiful countryside, half of it in the National Park, with many villages but no large towns, it is a very special part of the world. 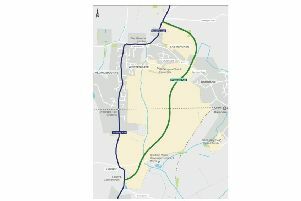 “There are many local issues which will continue to require strong representation: getting high speed broadband to every area; making sure that the much-needed Arundel bypass is delivered; keeping up the pressure for rail improvements after a dismal year; and pressing for fair funding for our schools. “Meeting the demand for more homes, while protecting the countryside and ensuring sufficient local infrastructure, will remain an enormous challenge. “I have been in the thick of these issues and have always sought to do my best for the local community. But of course local concerns are just one side of the MP’s role. “The election is being held at a vital time for our country. Following the referendum and Parliament’s vote to trigger Article 50 to leave the EU, we now have a difficult negotiation ahead. “The task is to achieve the optimal new arrangements for Britain, guided not by ideology but by what is in our national interest. It is important that the Prime Minister receives the strongest possible support for this. “As we embark on this new chapter in our history, Britain needs to be in strongest position to compete globally. We need to continue to rebuild our economy to improve living standards and deliver the funding which our public services will require. “This constituency divided 50:50 in the referendum, but I believe nevertheless - as I think most people do locally - that the overall result must be respected, and that we must now move on, come together, and work for the best possible deal for Britain. Mr Quin added: “The Government over the next five years has a huge task. We must secure a new, strong relationship with the EU, independent of its political structures but with us working closely together in our mutual interest. At home we must to continue to deliver the major economic success which enables us to keep people in work, deliver first class public services and bring down our national debt. “Given the task ahead, and with a newly mandated President of France and Chancellor of Germany soon to be in place I think it is absolutely right that the Prime Minister seeks her own mandate from the British people.